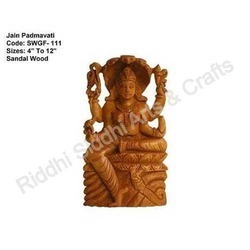 We are a leading Manufacturer of sandalwood statues, sandalwood ganesha statue, sandalwood laxmi, religious statue, sandalwood cultural craft and sandalwood krishna statues from Jaipur, India. Thus she is giver of every thing. 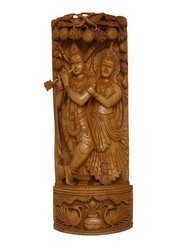 This statue made of pure wood by a master craftman of our company we produce many product of different verity in wood. 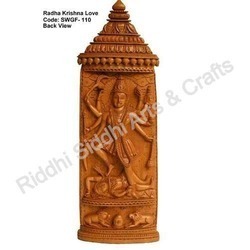 Shri Krishna appeared over five thousand years ago in Mathura, dist of state UP (India) to Devaki and Vasudeva in the jail of Kansa. 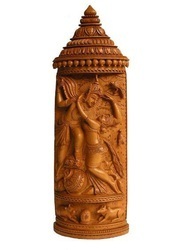 Kansa was the king of Mathura and mama of the lord Krishna. The Supreme Lord descends from time to time in this material world to reestablish the teachings of the Vedas. In His Bhagavad-Gita, Sri Krishna promises: "Whenever and wherever there is a decline in religious practice, O descendant of Bharata, and a predominant rise of irreligion--at that time I descend myself. To deliver the pious and to annihilate the miscreants, as well as to reestablish the principles of religion, I myself appear millennium after millennium." 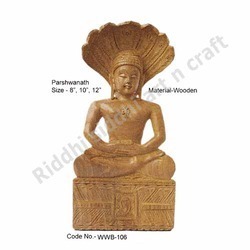 The range of Parshwanath Statue provided by us is very progressive and approachable from the business perspective and offering these gifts is an ideal way of doing marketing of your respective company. 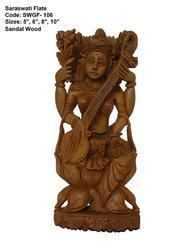 In the Devi Mahatmya, Saraswati is in the trinity of Maha Kali, Maha Lakshmi and Maha Saraswati. 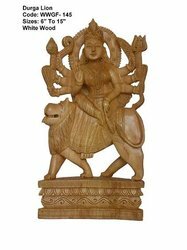 She is depicted as eight-armed. Her dhyna shloka given at the beginning of the Fifth chapter of Devi Mahatmya is: Wielding in her lotus-hands the bell, trident, ploughshare, conch, pestle, discus, bow, and arrow, her lustre is like that of a moon shining in the autumn sky. 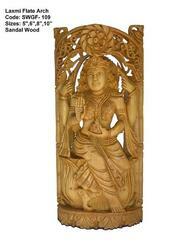 She is born from the body of Gowri and is the sustaining base of the three worlds. 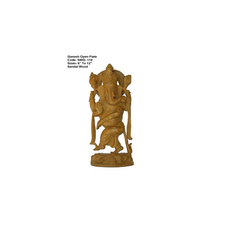 That Mahasaraswati I worship here who destroyed Sumbha and other asuras. 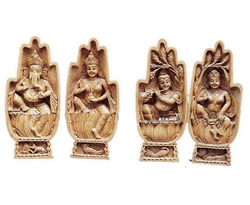 A unique wall hanging depicts the carved art from the skilled craftsmen of Rajasthan. Easy to hung on the wall with the help of a hook behind the hanging which will definintely add grace and charm to your home decor. 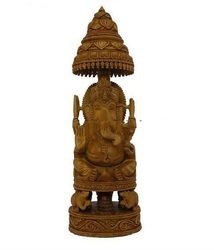 This beautiful sculpture made by a master craftsman of Rajasthan. He put his love & feelings in this sculpture. 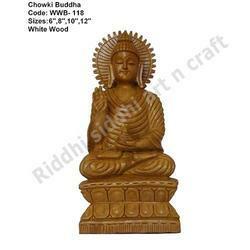 Our company made many products in wooden. 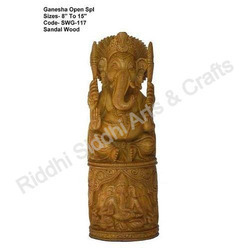 We have many categories in wood like sandalwood, rosary sandalwood, Mysore sandalwood, kadam wood, ebony wood, white wood & ordinary wood etc. 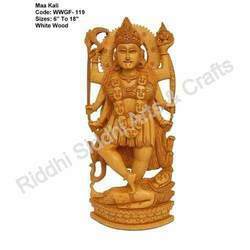 We made many different items by wood like god goddess statue, animal statues, bird statues, wooden jewelry & japa malas etc. We are special known in sandalwood beads mala. 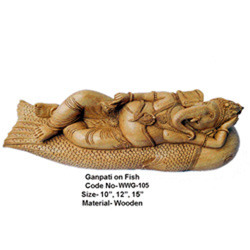 The Ganesha Statues made and carved by us are surely a classic piece of classical Indian handicrafts to cherish and behold.